I can’t believe that fall is here! Well, kind of. It’s suppose to be 90 degrees here this weekend. HA! But in the meantime, I’ll just keep wearing all my seasonal inspired outfits until it actually gets cold, because I’m SO ready for fall weather! 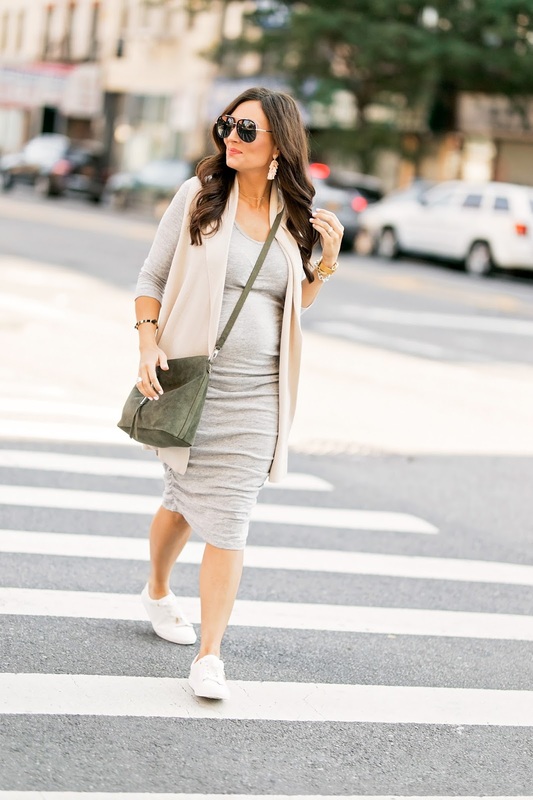 When it gets a little cooler, I plan on styling this neutral midi dress with everything. 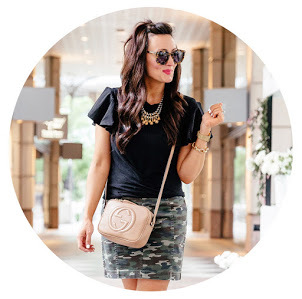 I’m talking booties and a moto jacket, biker boots and a fun camo bomber and with all kinds of sweater vests just like I styled it when I was in NYC. That’s the amazing thing about a staple piece like this, you can dress it up for a night out or dress it down with sneakers for a day of exploring a new city. 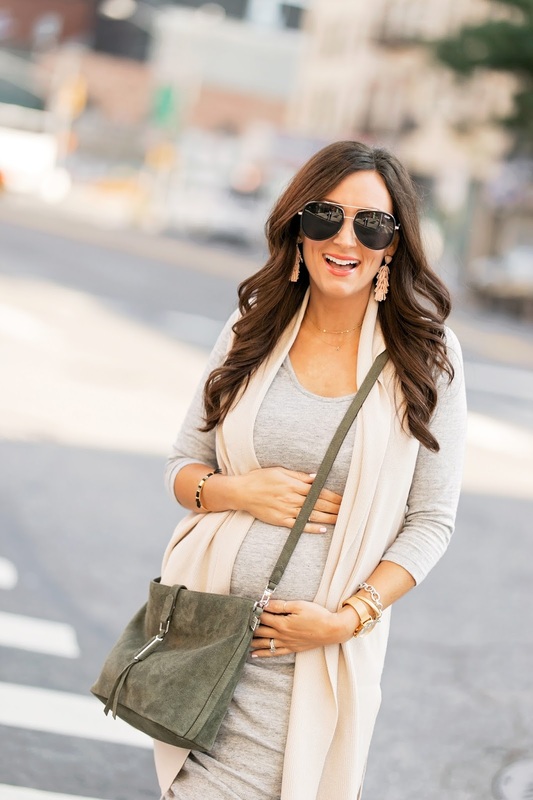 The dress in this post is maternity and SO amazing for a growing bump. It’s comfortable, neutral so that you can pair it with a lot of other items and the perfect length to flatter your figure. If you are looking for a similar option to style that is not maternity, this dress is on constant repeat for me as well. 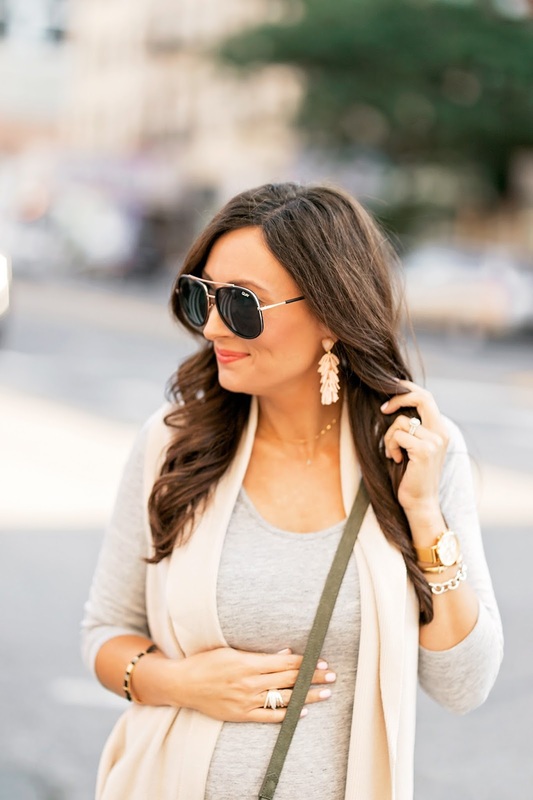 If you are looking to invest in a good pair of sunnies for under $60 to wear with all your fall outfits this season, these ones should be your pick. These are one of my most asked about items on my Instagram and everyone who has bought them has loved them! Highly recommend. 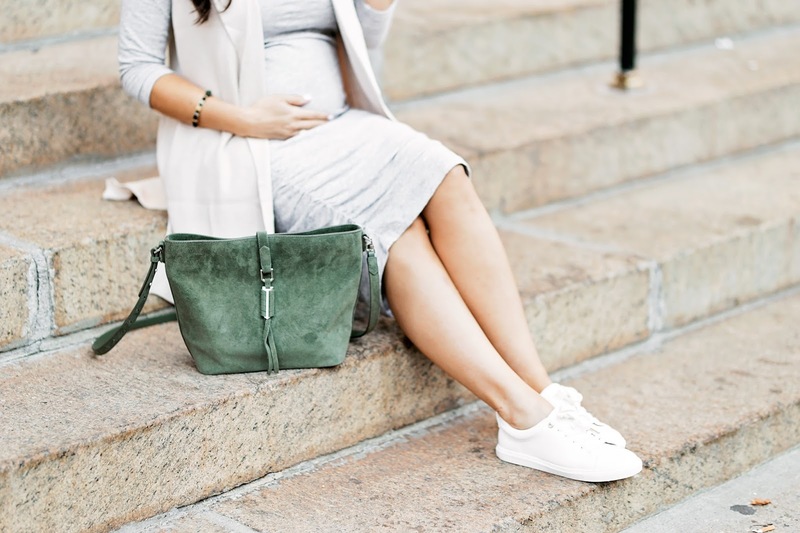 Can we take a second to talk about this olive green suede bag? Isn’t it gorgeous?! It’s the perfect shade for fall and the size is ideal for traveling or for everyday use. I’m in love! Now that it’s October, I’ll be stocking up on all things pumpkin for the weekend ahead! And I MIGHT also pick up this dress in another color. A girl has got to have options right?! Previous Post New York Fashion Week Recap!